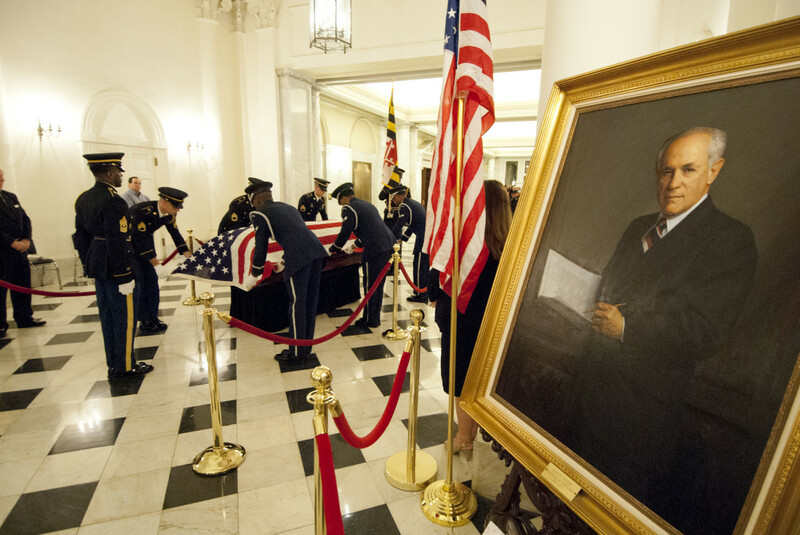 Marvin Mandel's portrait as governor was moved from the second floor to the State House rotunda for the viewing last week. Photo by Governor's Office. Simply put, Marvin Mandel — who was laid to rest last week at age 95 — ranks as the greatest and most effective Maryland governor of the 20th century. Only Gov. Albert C. Ritchie (1920-35) comes close to matching Mandel as a government reformer. But Mandel was far more ambitious in his efforts to improve society, expand the reach of government and anticipate future trends. Mandel defeated the potent National Rifle Association by enacting the nation’s toughest handgun-control law. He defeated the powerful insurance industry to win passage of the nation’s first state-run insurance company for high-risk drivers. He defeated the influential petroleum lobby to gain approval of a nearly 30 percent gas-tax increase that financed Baltimore’s first subway line, portions of the Washington-area Metro and local highway construction. He slugged it out with tavern owners and the potent beer barons to win a tripling of the state beer tax — the first increase in that alcohol levy in 33 years. He gained approval to buy Friendship Airport from Baltimore City for $36 million, beginning a modernization program that turned the re-named BWI Airport into one of the nation’s premier low-cost flight destinations. No Maryland governor took on so many entrenched and muscular special interests at one time. It was a stupendous achievement, following on the heels of three previous legislative sessions marked by sweeping government reforms that turned Maryland into a national model for streamlined efficiency and modernization. Mandel totally overhauled Maryland’s antiquated judicial system, junking the politically inspired magistrate system for a professional District Court with experienced and respected lawyers nominated by a judicial selection commission serving as judges. He created an intermediate appellate court that dramatically improved the quality of judicial decisions and anticipated the enormous jump in appeals cases. He removed politics from District Court and appellate court reappointments. He named cracker-jack deputy attorneys general to implement these judicial reforms — Robert F. Sweeney to run the new, statewide District Court system and Robert C. Murphy Jr. to lead the state judiciary as Chief Judge of the Court of Appeals. Mandel used his immense influence with the General Assembly (he served there as a key player for 17 years) to win approval of a massive government reorganization, shoe-horning 248 formerly independent agencies into 12 cabinet-level departments. It was a long and bitter reorganization with fierce resistance coming from deeply entrenched bureaucrats and interest groups. Cutting the powerful tentacles of the Maryland Port Authority and State Roads Commission proved especially difficult for the new transportation secretary, Harry R. Hughes. The new secretary of licensing and regulation, John R. Jewel, encountered enormous obstacles from dozens of special interest groups that no longer could dictate policy to various licensing boards. The new Department of Natural Resources ran into such intractable opposition from watermen and rural constituencies that Mandel persuaded former Gov. J. Millard Tawes to come out of retirement in Crisfield to smooth hurt feelings and pave the way for a successful transition. Mandel rarely lost battles with the legislature. He understood the psyche of lawmakers and how to play to each one’s weaknesses and vanity. He knew what strings to pull and when. He became known as Marvin the Magician, pulling a legislative rabbit out of his hat time after time when defeat seemed imminent. He battled hospitals to create the nation’s only state regulatory body setting hospital rates to bring down costs. It worked. He took on the hospitals again in establishing the nation’s first Shock Trauma network, prompting a nationwide revolution in emergency medicine. He set up the nation’s second statewide school construction program (Hawaii has the other) to relieve local governments of burdensome construction debt that was delaying urgently needed school buildings to handle a huge surge in school-age children. He fought for state land-use controls decades before “smart growth” came into vogue. He supported the Lee-Maurer education aid formula that steered a larger percentage of state funds to poor subdivisions, especially Baltimore City. It is an astounding record for the state’s second longest-serving governor (Ritchie beat him by a considerable margin, serving four terms in the 1920s and early 1930s). Yet Marvin Mandel is the last person you’d expect to earn the label of reformer and good government crusader. He was a product of the old-time political machines of Baltimore City. Soon, though, he broke from the grasp of corrupt boss James H. (Jack) Pollack and joined forces with a more modest political operative, Irvin Kovens, forming an anti-Pollack ticket in northwest Baltimore. He rose to political prominence by cunning and sheer luck. When the House speaker was indicted in Maryland’s first savings and loan scandal, Mandel took his place. When Spiro Agnew ran for vice president with Richard Nixon in 1968 — and won — House Speaker Mandel had the votes to succeed Agnew as governor. Through it all, Marvin Mandel remained an enigma. His prestidigitation was so flawless you never knew what was really going on. Three-dimensional chess was Mandel’s game and no one in Annapolis was capable of taking on the grand master. He could be amiable, jocular and easy-going, yet he turned into a tiger in formulating and carrying out political strategies. He seemed to fool everyone with the smokescreen he created when smoking his ever-present meerschaum pipe. Puff, puff, puff. A few nods of the head. Visitors thought they were getting agreement from the amiable governor — only to discover later they had misread the situation. In political mid-stream, though, Mandel’s fortunes and his demeanor changed. His luck started to run out. His secret private life blasted into the headlines. His expensive new lifestyle came at a cost he could not personally afford. His backstage maneuvering to make close friends and allies rich through passage of favorable legislation in Annapolis became a long-running national scandal. The magician who so brilliantly reformed Maryland government would pay a steep price for this terrible lapse in judgment. Representatives from the alcohol industry told the Maryland Board of Revenue Estimates Wednesday that the state’s year-old 9% sales tax on alcoholic beverages has produced stagnant growth in liquor sales in the past year, while growth in neighboring Virginia and Delaware was above the national average. Banking and real estate panelists also speaking at the board’s economic advisory forum said state and federal regulations will hinder potential private sector growth as the federal fiscal cliff approaches.